The facades of showcase Chicago buildings of the 20's and 30's are often ripe with restrained ornament. How often do we really see it? How often, instead, do we just see past it, letting it fade into the visual noise of the contemporary streetscape? Recently, I'm been taking a closer look and, frankly, a lot of it is pretty stiff - well crafted but ossified depictions of classical motifs, like the lady to the left, who resides on the 545 North Michigan Building that hosts a new Nokia store. You might take her home to mother, but probably not for a night on the town. 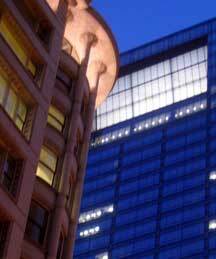 The building itself is probably the biggest-scale facadectomy in architectural history. In 1999, after an agreement between preservations and developer John Buck, over 4,000 stone panels were painstakingly removed and the actual building, a 16-story high, 1929 design from Thielbar & Fugard, demolished. It had seen better days. I worked in the building for a time and remember two things: the faded but still impressive, wood-paneled chairman's office on the penthouse floor, with its impressive views down Michigan avenue, and the day I reached down to pick up what I thought was a tortoise-shell comb only to discover it was actually a ridged potato chip crawling with ants. A new building was erected, matching the massing of the original, and the facades carefully re-assembled, like a jigsaw puzzle, using the original panels. The historic storefronts have been restored and retail still commands the lower floors, part of the Nordstrom's-anchored North Bridge Mall, but the rest of the building is now a modern hotel. The ram you see above is paired at the opposite end of the floor with an equally charming ram. The next time you're walking down this stretch of the Mag Mile, especially if it's a sunny day, look up. It's one of the best shows on the street. We received a reminder yesterday from the folks from Global Green that 5:00 P.M today, Wednesday, August 30th is the deadline for casting your vote for one of the six finalists in the organization's Sustainable Design for New Orleans Competition, which includes an entry from Chicago's Brininstool & Lynch. The competition was co-sponsored by Brad Pitt, and jury is to include Thom Mayne, Walter Hood and Marion Weiss. You can go to the competition's website, register you email address, look at all the entries, and place your vote. Even without voting, you can see all the boards here. Germany's new tallest escalators are orange - three guesses whose building they're in. We recently came across the announcement from ThyssenKrupp Fahrtreppen that they've has just completed installation of the "two tallest freestanding escalators in Germany", with a total rise in excess of 23 meters. 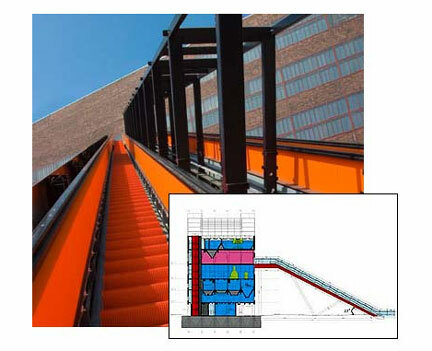 Guess who the architect is (hint: the escalators are bright orange) and read more about the remarkable Zeche Zollverein complex in Essen, Germany here. 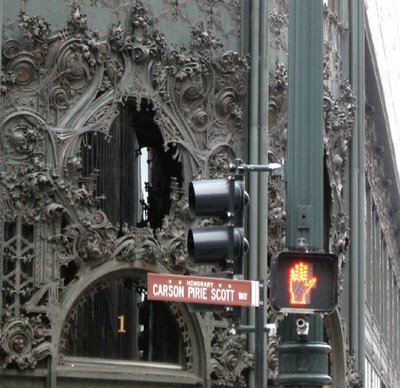 Last Friday saw the sudden announcement by its current owners that the century-old Carson Pirie Scott department store on State Street, one of architect Louis Sullivan's greatest masterpieces, will be shut down by March of next year. I'll be writing a lot more about this, and about the journey of Chicago's State Street from one of the world's greatest shopping venues to a a diminished collection of discounters and outlet stores, when Federated rebrands the venerable Marshall Fields in Macy's colors as its local flagship in September, but for now here's a few initial thoughts - and more pictures - and what's going on and where we might be heading. Read and see it here. 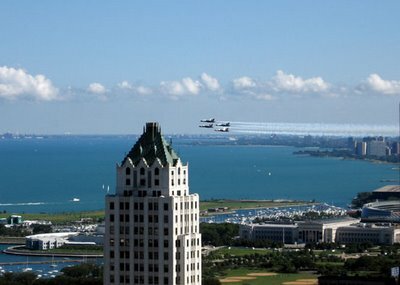 Late each August, the Chicago Air and Water Show draws millions of people to the city's lakefront, and each year the big finale everyone waits for is the precision maneuvers of the U.S. Navy's Blue Angels (alternating yearly with the Air Force's Thunderbirds). The six F/A-18 Hornets race in and out across the city to regroup over their performance site just beyond the lakefront beaches, emitting a piercing pinpoint roar as they tear through the sky, only to disappear out of view in an instant. And then that sharp crescendo returns, at first faintly, but in a split second escalating to an ear-crunching roar, only to retreat into sharp diminuendo seemingly at the concurrent moment of its arrival. 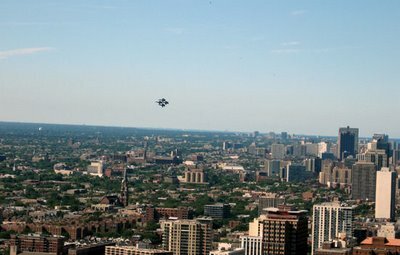 It's an impressive routine no matter where it takes place, but over the center of a great, dense city like Chicago, it has a power it has nowhere else, combining the exhilaration of flight with an unsettling subtext. 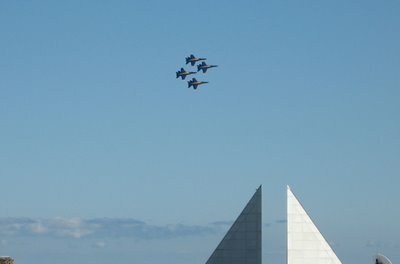 As the planes move with their blazing speed over the sea of moored towers, you get a sense of mirrored vulnerabilities. Against the huge mass of the city, the jets look like specks that you could fling from the sky with a flick of your thumb, but at the very same time you can't help but remember the true purpose of these stunningly sleek machines as delivery systems for destruction and death; their small yet powerful presence intimates the fragility of all of our mighty and manifold constructions. A terrible beauty, as Yeats once said. John King, the perceptive architecture critic from my second favorite city, San Francisco, recently spent some time in Chicago and the result has been two major articles in the San Francisco Chronicle on our city and its architecture. The first was written for the paper's travel section, but it's actually a great overview of Chicago's architecture, including a look at Perkins + Will's Ralph Johnson's new Contemporaine on Grand, one of the city's best new residential buildings. 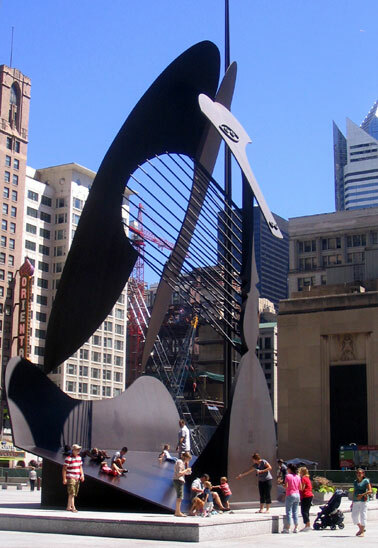 There's the obligatory gloss on the wonders of Millennium Park, but also a critique of the "cookie-cutter capitalism" that has created "too many tall towers that generate profit but don't stir the imagination." There are thumbnail sketches of 10 prominent landmarks, from The Rookery, to Inland Steel, to Marina City and 111 South Wacker. It's a great read for both visitors and local architecture buffs. Then on Saturday, August 12th, King published a second piece on how San Francisco mayor Gavin Newsom is looking to Chicago Mayor Richard M. Daley for inspiration. Inevitably, such an account includes a lot of discussion about Daley's role in moving the city forward, especially with his intense focus on environmental issues. Newsom, serving in a city whose obsession with diversity and inclusiveness often seems to wind up invoking paralysis rather than progress, understandly looks longingly on Daley's aura of a strong-man able to act seemingly unencumbered by undue process or dissent. Anyone who has read my musings on the subject know I find this to be a dangerously two-edged sword. Nowhere is this better illustrated than in the way the mayor recently repaid Newsom's admiration by telling a San Francisco official who had come to testify in support of Chicago's living wage ordinance to basically shut up and go back where he came from. "They should go back and help their own cities.... you manage your own city. We manage here. . . . We've got more work going [on] downtown in one block than . . . those cities [San Francisco and Santa Fe] combined." A perk of being a kind of elected monarch is that you can tell that kind of whopper with a high confidence no one will want to contradict you. If the mayor says so, it must be true, at least until the contradictory reality can no longer be swept under the rug. It's always refreshing - and instructive - to read how an acute observer like King sees us, and both of his articles are well worth checking out, here and here. 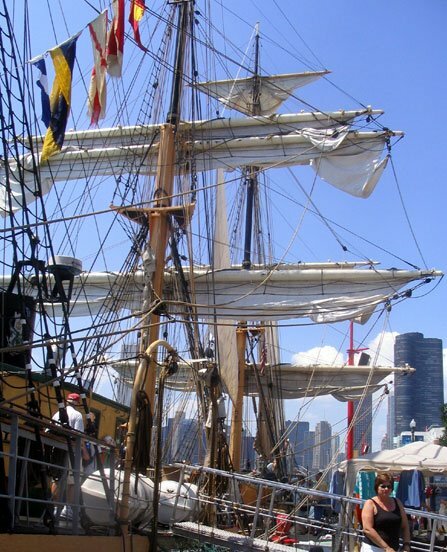 110 in the Shade - Where would we be without ASHRAE Illinois, marking its 100th year? Joan Pomeranc of AIA Chicago passes on the news that the Illinois chapter of ASHRAE, the American Society of Heating, Refrigerating and Air Conditioning Engineers, turned 100 years old last month. ASHRAE, its parent, was founded in 1894, and has grown to 172 local chapters with 55,000 members globally. Illinois ASHRAE became the organization's first local chapter, on July 19, 1906, and it remains the largest to this day. Putting aside for the occassion the fact that our obsession for creating an indoor climate that's perfect year-round has probably played a prominent position in heating up the globe and placing our fate in the hands of countries who don't much care for us, being able to escape Chicago's (decreasingly) bitter winters and (increasingly) overheated summers is one of the real perks, along with expanding longevity, advances in health care, and big screen plasma TV's, of living in modern times. 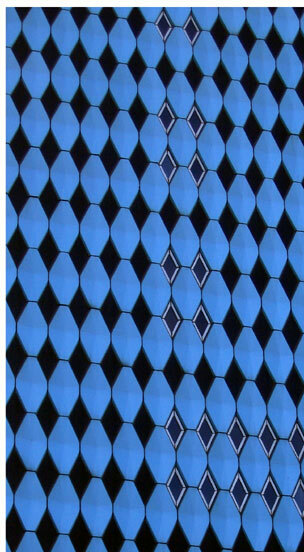 We can only hope that the next century of ASHRAE will see the attainment of Transsolar's Matthias Schuler's goal of creating technologies that let buildings breath naturally, without chillers, even as we remain thankful, however guiltily, for the heavy-duty air conditioning that makes our current legacy of environmental clunkers bearable. 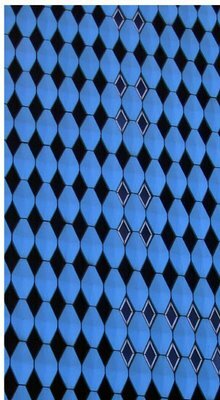 Blue Diamonds - no almonds required. Do you know it? Via Pauline Saliga of SAH and Joan Pomerance of AIA Chicago comes word that the sesquicentennial of architect Louis Sullivan's birth is being celebrated not just in Chicago, where the newly renamed Chicago History Museum is spearheading Louis Sullivan at 150, a month-long series of events being sponsored by a wide range of the city's cultural institutions, but also by Grinnell College and the City of Grinnell, Iowa, with a five day sequence of events from August 30th to September 3rd. Grinnell is the site of Sullivan's Merchants National Bank, which opened on New Years Day in 1915. According to Sullivan biographer Willard Connelly, after meeting with bank officials and visiting the site, the architect "bought at a drugstore a few sheets of yellow paper. Sitting with the committee in a little room of the old bank, adjoining the president's, he took a common desk ruler and sketched his entire plan." The result was one of a series of small bank commissions that sustained Sullivan late in his life, in polychrome brick. "The brick, through with extremes from deep blue to bread-crust brown, he so skillfully distributed that its hue as a whole seemed to be garnet," writes Connelly. The bank's most photographed feature, however, is its entrance, described by a later biographer, Robert Twombly, as an "incredible burst of terra-cotta surrounding the stained glass ocuulus over the entrance. At least eight layers of diamond, circular and square banding, infilled with geometric and organic ornament in brown and green, combined to form a giant medallion . . . "
On August 31st Twombly, himself, will provide the keynote lecture, Louis Sullivan and his Legacy, for the Grinnell symposium, which includes other lectures - including one by the U of I's Paul Kruty, as well as music, documentaries, and tours of the bank, all culminating with a celebration on Sullivan's actual birthday, September 3rd. There will be cake. Chicago's Graham Foundation for Advanced Studies in the Fine Arts has announced the winner and finalists for its 2006 Carter Manny Award, recognizing academic disserations on architectural topics. The top award, which comes with $15,000 of financial support, went to Timothy Parker of the School of Architecture at the University of Texas at Austin, for his dissertation on the topic of The Modern Church in Rome: Architecture, Theology, and Community, 1945-80. Parker’s paper looks at sixty parish churches designed in Rome after World War II. “Twentieth-century religious architecture in general is conspicuously unstudied. I suggest that one reason for this is that, while our understanding of modernism undergoes continual revision, modernism remains largely a secular concept.” Parker explores the place of religious architecture in "canonical modernism." Merit citations went to Kathleen E. Foley of Cornell for Islamic Centers and Land Use Conflict in the Suburbs: Designs for a Place in the American Landscape and Membership in the American Polity; Lucia Allais of MIT for Will to War, Will to Art: Cultural Internationalism and the Birth of the Functionalist Monument, 1932-1960, and Alexander Eisenschmidt of the University of Pennsylvania for Preconditioning Modern Architecture: Urban Formlessness and Architectural Form in German Modernity, 1900-1914. It would be nice if the papers were actually made available to the general public, but that is apparently not how the academic world works. According to the Graham's website, "Award winners will be encouraged to present their dissertation in a public forum at the Foundation." 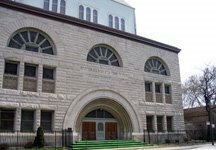 The Graham already provides a valuable service, unique among Chicago architectural institutions, of putting its lectures up on their website for viewing. The Graham Foundation's new Executive Director Sarah Herda just hit town a few weeks ago, and WBEZ's Edward Lifson snared her first local interview for his Sunday morning program Hello, Beautiful, You can listen to the interview here. Previously, Herda, 32, had served, since 1998, as director of the Storefront for Art and Architecture in New York. At the Graham, she will oversee about a million dollars a year in programs, books, and exhibitions supporting the study of architectural topics. Herda told Lifson that she's been "spending a lot of time in the archives," which go back fifty years, and is interested in "making that history more available to the public." She said she's also been walking the city and its neighborhoods. "Every neighborhood I've been to has impresssed me in different ways." "Chicago strikes me as a place where architects build buildings," said Herda, which would indicate she still hasn't stumbled upon the fact the city's best architects - especially the younger ones - have been largely locked out of the city's current building boom until very recently, but she'll learn. She's already hit on one of the key issues. "It would be interesting," she told Lifson, "to think about ways that people could participate in insuring that we have better buildings, better design, in the city." 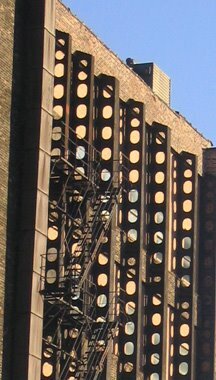 This past Friday, news outlets including the Chicago Tribune and Crain's Chicago Business reported the Mills Corporation is about to turn over control, in a deal scheduled to close within the next month and a half, of the office and residential components of the downtown Chicago's Block 37 project to the venerable Chicago firm of Golub and Company. 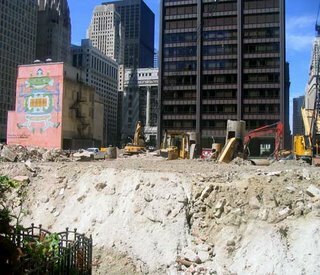 The beleagured Mills Corporation was only the latest of a long line of developers taking a bat at developing Block 37, across from the flagship Marshall Field - soon to be Macy's - store on State Street, a full-block site that has stubbornly resisted rising above anything other than a dirt farm since every last structure on it was hurriedly demolished in 1989. 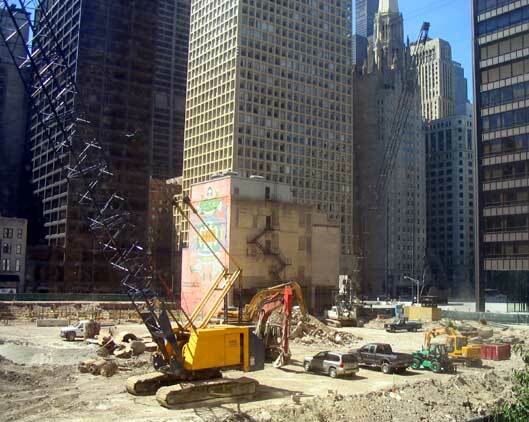 Construction had already began on the office building, which is to provide a new headquarters to the Morningstar investment firm, as well as new facilities, including a streetside studio, for CBS Chicago. What was new in the announcement is that Golub is saying it expects to now also break ground for two new residential towers, to be designed by Solomon, Cordwell Buenz - one condo, one rental, with a previous hotel component dropped - this coming Spring. 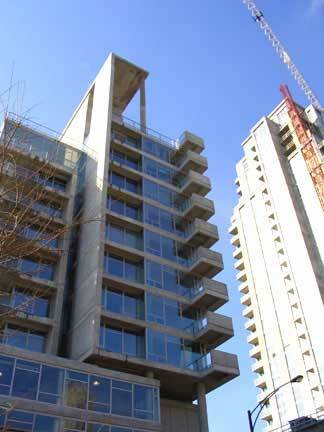 Mills retains control of the block-long retail portion of the project, being designed by Gensler Chicago. Earlier in the year, construction workers walked off the project as the firms they worked for claimed they weren't getting paid by Mills. Now, however, cranes and heavy-duty construction equipment can be seen in daily operation on the site. Could this finally be the real thing? I like to believe it's true, but I'll feel a lot better when we actually see something rising out of the ground. For countless months now, the only new construction on the site has been the giant mounds of dirt taken from the equally giant pits and moats being excavated all throughout the block. Also in Crains is an eye-opening article on a new Civic Federation study revealing the dirty little secret that, despite Chicago business's constant complaint of increasing property taxes, their effective tax rate has actually dropped by more than half from 1999 to 2004, as the residential building boom has seen home and condo rates soar and homeowners assume an increasing share of the property tax burden. 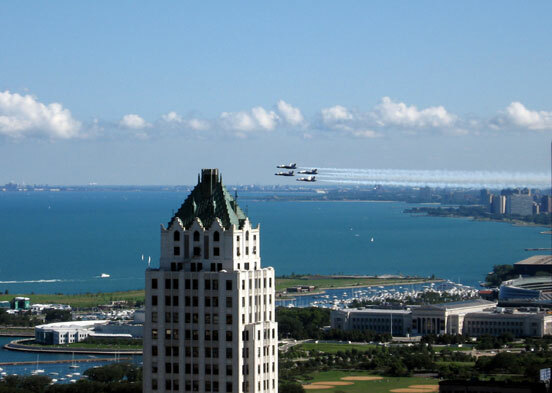 While Chicago's commercial and industrial rates remain higher than in suburbs like Oak Brook, they're now on a par - or actually a tad lower - than in locales such as Naperville, Joliet and Elgin. 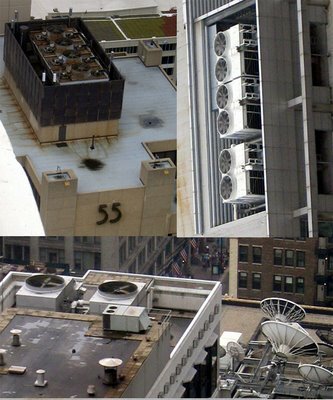 For decades after it's 1968 completion, architect Harry Weese's Time-Life building (now known by its address, 541 N. Fairbanks) dominated Streeterville. McClurg Court's two towers and the 1926 Furniture Mart may have had it beat by a few feet, but it was the Time-Life - it's no-nonsense, brawny, big-boned, deep tawny Corten steel frame little brother to Jacques Brownson's 1965 Daley Center in the Loop - that provided the visual anchor for the district. Now, the great building boom that has marked the turn of the 21st Century is re-ordering the scale of Chicago's skyline, turning once dominant towers into dwarfed also-rans. It used to rise majestically from a surrounding a sea of surface parking lots, but today the Time-Life is being pinched between two new high-rises, the Streeter to the east, and the Fairbanks at Cityfront Plaza to the West. It's becoming an eclipsed remnant of the architectural landscape of the 1960's, just as the domed Jewelers Building on east Wacker, a child of the booming 20's, which once rose out of a fabric of low-density parcels along Wacker beside the river, punctuating a great Chicago street vista that endured for three-quarters of a century, is being crowded out by a new king-of-the-hill, Adrian's Smith 1362-foot-high Trump Tower. Wax nostalgic for a moment and move on. A new visual order approaches. Joanne Asala of Compass Rose Cultural Crossroads, emailed us to let us know of another great free download that follows on the heels of the wonderful facsimile of the 1925 Balaban & Katz magazine featuring the Uptown Theater that they put up earlier this year. This time it's a facsimile of the 1921 edition of the American Builder magazine devoted to The Work of Walter W. Ahlschlager. 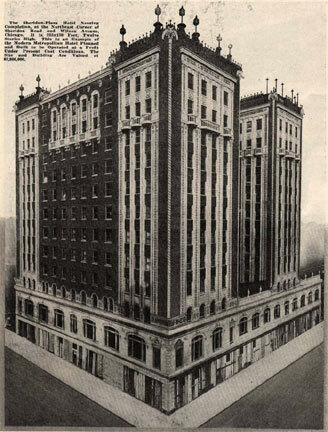 Ahlschlager is one of the lesser known Chicago architects responsible for some of our more high-profile buildings, including the Inter-Continental Hotel on North Michigan, with its great carved reliefs and yellow-domed dirigible moaring at the top. He also designed the wildly ornate Uptown Broadway Building, at Broadway and Leland. The emphasis in the American Builder reproduction is on several then new residential projects such as The Sovereign at Granville and Kenmore, the Parkway and the Webster, with prime of place given to the Sheridan Plaza residential apartment hotel at Sheridan and Wilson. then being completed. There are construction photos, floor plans, shots of various interiors including grand lobbies, and a host of interesting period ads for everything from elevators, to terra cotta ornament, marble, fire escapes - even Dutch Boy paint from the National Lead Company (??!!). It's another great snapshot both of the work and the time, and you can download it in Adobe Acrobat PDF format, for free. In their own time, sailing vessels like those in Tall Ships Chicago 2006 were among the tallest man-made structures, scraping the heavens on water as the spires of churches and cathedrals did on land. 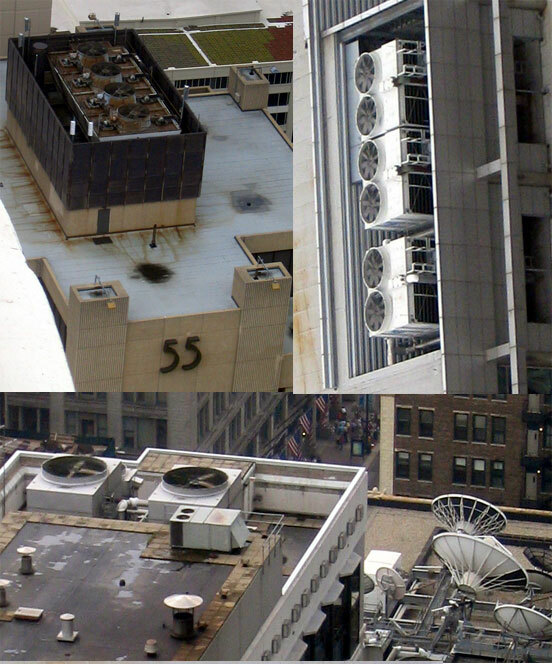 Read about how they stack up next to Chicago's tall buildings - and see all the photos - here. Form Based Codes - Reform or Legislated Mediocrity? The City of Evanston's Plan Commission is sponsoring a talk tonight, Tuesday, August 8th, by Paul Crawford, chairman of the Form Based Codes Institute, with the title Form Based Codes: An Alternative Approach to Regulating and Shaping Development. 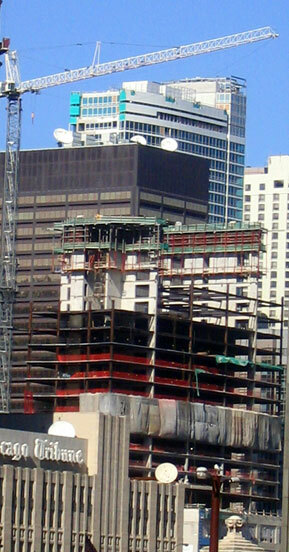 To quote from the commission's description, "Often associated with Smart Growth and the rise of “New Urbanist” planning concepts, form-based codes place primary emphasis upon the physical form of development, including building height, bulk, façade treatments, the relationship of the buildings to the street and to one another and the location of parking." For information: you can email Tracy Norfleet, General Planner, or Susan Guderley, Neighborhood Planner, but since the seminar is tonight I'd recommend calling 847/866-2928. The concept bears the fingerprints of New Urbanists like the ubiquitous Andres Duany. . . . Continue reading here. 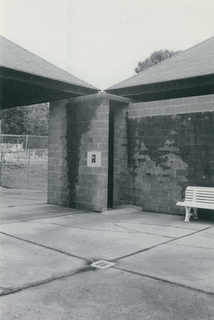 Reprieve in works for Louis Kahn's Trenton Bath House and Chicago's Cook County Hospital? Sometimes there's actually good, 0r at least encouraging, news to report on the preservation front. An email on Sunday from architectural historian Susan Solomon, who has been working to save Louis Kahn's 1955 Trenton Bath House, a set of four interlocking, pyramid roofed pavilions, reports an emerging deal in which Mercer County will purchase the 44 acre wooded site that includes the Bath House for use as a new senior center, and preserve the Kahn structures, which are listed on the National Register of Historic Places. According to a report in the Trenton Times, the county continues to negotiate with two separate property owners who split ownership of the site, with a formal agreement still to be reached. Solomon and Friends of the Trenton Bathhouse continue to lobby on behalf of the purchase. In Chicago, things may also be looking up for the historic Cook County Hospital, famous nationally for doubling as the exterior of the hospital featured in the long-running NBC television series ER. Ever since operations moved to a new Stroger Hospital in 2002, Cook County Board President John Stroger appeared adamant on razing the 1914 building. The county's original convoluted plans called for replacing the park in front of the old structure with major new construction, demolishing the 1914 building, and creating a new park on the cleared site. 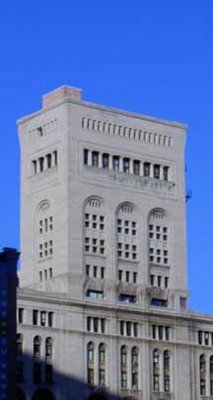 Stroger's unyielding determination, despite a rising tide of opposition, made the loss of the building to almost seem a foregone conclusion - it was dropped from the 2004 AIA Guide to Chicago. However; activists like Preservation Chicago, a grass roots architectural preservation advocacy group, continued to work to save the hospital, including a petition drive that obtained more than 13,000 signatures. Independent County Board members managed to muster enough votes to put demolition plans at least temporarily on hold. 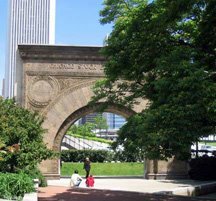 A stroke earlier this year led Stroger to decide to retire from his post this past July, and now new incoming acting Board President Bobbie Steele has put her weight behind saving the structure, sending a letter to the Commission on Chicago Landmarks supporting landmark designation. 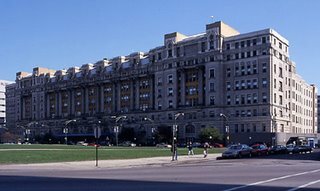 The 1914 Hospital, by architect Paul Gerhardt, is remarkable for its rich Beaux Arts facades and terra cotta ornament, for the way its distinguished massing holds down its site and adjoining park, and for its role for almost a century in guaranteeing generations of emigrants and the city's less affluent residents quality health care. 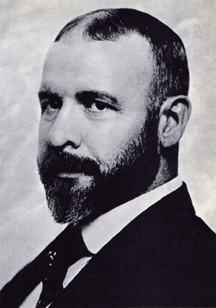 Architect Louis Sullivan, had he lived, would have turned 150 on his upcoming September 3rd birthday. Working with other arts and architecture organizations in Chicago, the newly renamed Chicago History Museum has just put up Louis Sullivan at 150, a website on all things Sullivan, with a calendar listing the numerous tours, seminars, lectures and films that will take place over six plus weeks beginning on September 2nd in honor of the legendary Chicago architect. Among the highlights are a number of tours of the Charnley-Persky House, as well as a series of Louis Sullivan: Lost and Found Loop walking tours, on Wednesdays and Saturdays over five weeks, under the auspices of the Chicago Architecture Foundation. On September 17th from 1:00 to 4:00, a Richard Nickel Bus Tour will be led by his biographer, Richard Cahan. On September 18th, there will be tours of the Auditorium Building, as well as "The Parthenon of Modern Civilization: The Restorations of the Auditorium Theatre" a panel discussion with Ben Weese, FAIA, Jack Hartray, FAIA, Laurence Booth, FAIA and Daniel P. Coffey FAIA; moderated by Rick Kogan. There will also be concerts in Ganz Hall. Louis Sullivan & the Beaux Arts. The Newberry Library will offer up a ten week seminar by scholar-in-residence Diane Dillion on The Architecture of Louis Sullivan. CAF tours of Holy Trinity Cathedral on September 9, 23 and 30, where, on September 24th, there will also be a fundraiser to benefit the church's restoration with historian Tim Samuelson and the Pan Orthodox Choir. 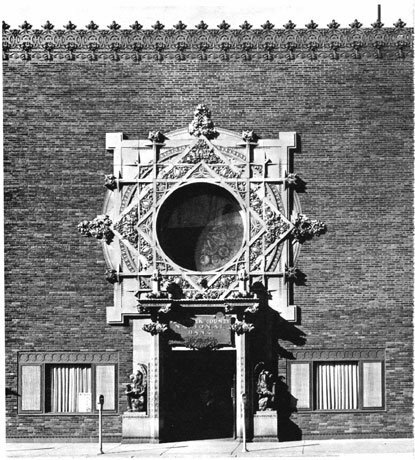 On October 4th, another seminar, Chicago's Great Heritage: Preserving the Work of Louis Sullivan" will feature Mary Brush, Gunny Harboe (who recently completed the restoration of the long-missing cornice on Sullivan's Carson Pirie Scott store on State Street), and Vincent Michael. October 12th will bring the first Chicago screening, at the Graham Foundation, of a new half-hour documentary: The Small Town Banks of Louis Sullivan, followed by a discussion that will include the film's producer and director, Joe Federici. The celebration will end with a three day symposium, Louis Sullivan at 150, October 13 through the 15th at the Chicago History Museum. The Louis Sullivan at 150 website includes over 50 events spread on 29 separate days, and also offers up an extended biography of Sullivan, his partnership with Dankmar Adler, his work, life and writings. There's a very generous complement of photographs of Sullivan's buildings and ornament. It's a site that draws you in with its depth of interesting content, and if the various events live up to the same high standard, we're in for a great celebration.